Robert Heber-Percy - Faringdon Community Website. Robert Vernon Heber-Percy the squire of Faringdon, (formerly Berkshire) who has died aged 75, was an English eccentric in the grand tradition. Devoted to books, paintings and the beautification of his estate, he built follies, rode to hounds with his reins held at the buckle on the tips of his fingers, and was the proprietor of an undertakers business. Legion were the tales of this larger-than-life figure, particularly following his adoption as the protégé of the equally eccentric author, painter and composer, the 14th Lord Berners, familiar to readers of Nancy Mitford as ‘Lord Merlin". As Miss Mitford’s sister, Diana Mosley, has written, Heber-Percy’s "high spirits, elegant appearance and uninhibited behaviour enchanted Gerald (Berners) who no longer needed a drug to give him contentment"
In Salzburg Heber-Percy hurled a glass tankard from an upper window, narrowly missing a pedestrian below. In Florence he once arrived at the Hotel Excelsior, carried semi-conscious on the shoulder of Lord Berners. Robert Vernon Heber-Percy was born in 1911, the youngest (4th) son of Algernon Heber-Percy, a kinsman of the Dukes of Northumberland and Gladys May Hulton-Harrap: he was brought up at Hodnet Hall, a vast neo-Elizabethan pile in Shropshire. His brother, Cyril, wrote of Robert: "He was full of fun, up to every prank, could hoodwink most people, and developed a gift for repartee. To this day he is capable of the most diabolical hoaxes." Educated at Stowe, he was commissioned into the King’s Dragoon guards but his antics cut short any prospect of a military career. In 1950, following the death of Lord Berners, Heber-Percy inherited Faringdon, the fine Georgian house celebrated for such idiosyncrasies as fantailed pigeons dyed pink, orange, green, blue. Robert Heber-Percy maintained and enhanced Faringdon’s exotic atmosphere, constructing a swimming pool reached by high steps and overlooked by giant gryphons. The floor of the changing room was inlaid with pennies. Far from an idle aesthete, he would rise at dawn to work in the fields. 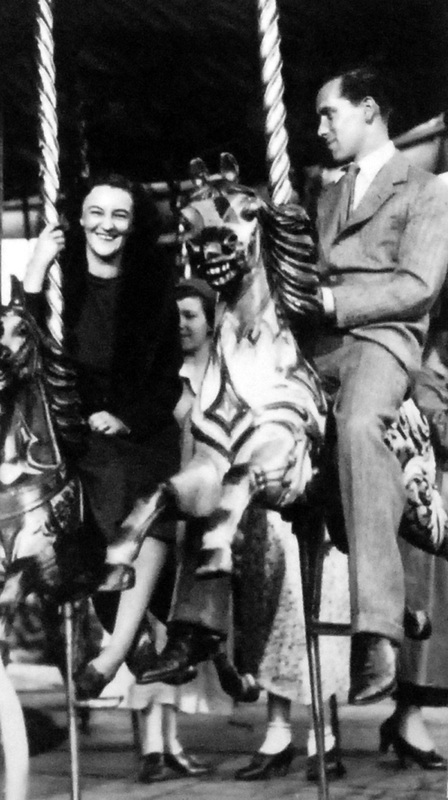 Heber-Percy married first in 1942 (dissolved 1947) Jennifer, daughter of Sir George Fry, Bt, and they had a daughter. In 1985 he married secondly, Lady Dorothy ("Coote") Lygon. They parted amicably a year later. Robert Heber-Percy died on 29th October 1987. At his funeral (on 5th November, his birthday) the Church bells rang ' Holy holy holy... Lord God almighty just as everyone stood to sing the first hymn. The mourners had to wait for bells to finish sounding before the organ could start. All wreathes were only of leaves as he had a passion for the trees at Faringdon (House). His ashes were scattered around the lake at Faringdon House. Robert Heber-Percy took a real interest in Faringdon. He gave Faringdon Folly Tower and woodland to the town in 1980s. Every year he provided a splendid strawberry tea for the ladies of the Silver Threads in the Orangery. It was a high point of their activities. He gave permission for local people to fish in the lake and to walk their dogs in the grounds. He allowed the grounds of Faringdon house to be used for the towns annual fete. The annual firework display in the Grounds of Faringdon House started in his time, and continues still. He helped a number of individuals and small businesses. He allowed Brownies, guides, scouts and cubs to climb the Folly tower, before it was opened to the general public. He gave funds to the Berner Trust to help publicise and continue the work of Lord Berners. He was the godfather of Kit Lambert (son of Constant Lambert), the manager of the Who, and a share holder in the band.